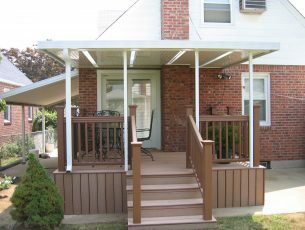 Patio Covers Non-Insulated | Wrisco Industries Inc.
Wrisco Structural Patio Cover Roofs, which feature a completely flat underside, meet or exceed the stringent requirements of the International Conference of Building Officials in all areas of the United States. Fabricated of precision roll formed aluminum structural roof pans, Wrisco structural roofs are a marvel of modern metal engineering technology, providing exceptional strength without unsightly bulk of external support bracing. 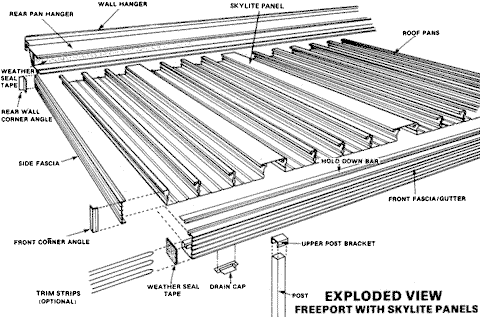 In addition, the fascia/gutters, wall hangers and setback beams of every Wrisco Patio Cover or Carport are fabricated of heavy duty, lifetime extruded aluminum. Aluminum flat pan roof panels as shown, with or without skylite. All connection system parts extruded, hanging rail assembly (wall hanger, rear pan hanger), front 5″ fascia gutter, 5″ side fascias (without gutter), full hold down bar, corner trim angle and drain caps. All hardware included for assembly of patio roof. White roof flat pans with white extruded connection system. Gutters and side fascia available in White, Brown and Sand. Posts or columns must be ordered separately. Wrisco pre-engineered Patio Covers are designed to suit a variety of site, roof and residential conditions. Your Wrisco dealer is uniquely qualified to assist you in planning a custom room enclosure to harmonize with your home and family requirements. Freestanding or attached, a Wrisco carport will beautifully and economically protect your car from the harmful effects of sun, rain, snow and other extremes of weather. Wrisco carports are available with optional skylights in a variety of sizes and configurations designed to tastefully complement your home surroundings.